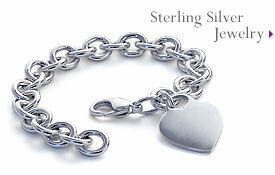 The silver jewellery and accessories available at Blue Nile are made of beautiful sterling silver. For our collection, we have chosen classic designs created by some of the finest silver craftsmen. This guide will help you learn to identify quality in silver jewellery and accessories. For jewellery that lasts, all our silver jewellery, like this Sweetheart Locket, is pure sterling silver. Pure silver, also called fine silver, is relatively soft, very malleable, and easily damaged so it is commonly combined with other metals to produce a more durable product. The most popular of these alloys is sterling silver, which consists of 92.5 percent silver and 7.5 percent copper. Although any metal can make up the 7.5 percent non-silver portion of sterling, centuries of experimentation have shown copper to be its best companion, improving the metal's hardness and durability without affecting its beautiful colour. The small amount of copper added to sterling has very little effect on the metal's value. Instead, the price of the silver item is affected by the labour involved in making the item, the skill of the craftsperson, and the intricacy of the design. Most high quality silver items are stamped with a "fineness" or "quality" mark. This mark designates the precious metal content of the jewellery, and under federal law, must be accompanied by a maker's mark or registered trademark. With proper care, your fine quality silver will last a lifetime. To minimise scratches and other damage, store your silver jewellery either in a cloth pouch or in a separate compartment in your jewellery box. Avoid exposing your silver to household chemicals when cleaning with bleach or ammonia, or when swimming in chlorinated water, as these chemicals can damage silver. Care should also be taken to prevent silver tarnish build-up, a dulling that naturally occurs when silver reacts with sulfur or hydrogen sulfide in the ambient air. To clean your silver, use polishes formulated specifically to remove tarnish. You can find fine silver polishes, solutions, or cloths appropriate to remove tarnish at most hardware stores or specialty craft stores. Tarnish is most easily removed when it first becomes visible. Although wearing your silver jewellery often is the best way to prevent tarnish from building up, regular cleanings of all your silver items will prevent tarnish and keep your silver bright and sparkling. Look for the fineness mark and the maker's mark on the underside of the silver item you are considering to ensure the quality.